We are nearing the end of an intensive recruitment period, looking for excellent established and emergent scientists to help us realize the goals of this interdisciplinary project. This week we are very pleased to welcome Dr. Ben Blamey to the team. He will work in the Hellander lab, in close collaboration with Dr. Salman Toor, and focus on computer science challenges in designing and developing smart and efficient systems for managing scientific data, and image data in particular, in distributed computing infrastructure such as hybrid and fog cloud. With a background on research in machine learning, natural language processing and in development of services in cloud infrastructure both in academia and in industry, Dr. Blamey brings critical experience to the team. 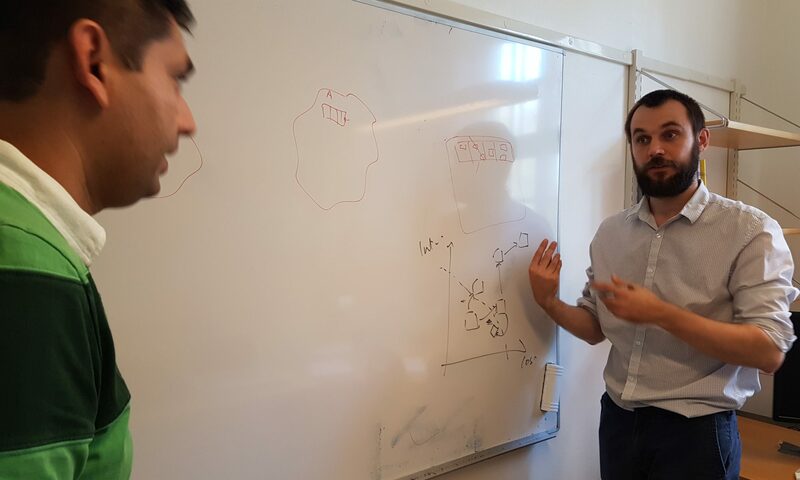 In the featured image Dr. Blamey (right) is busy discussing a potential design of an intelligent system to manage information hierarchies in distributed environments with Dr. Toor (left).